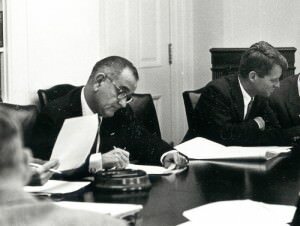 LBJ in an ExComm meeting on October 29, 1962. In the clip below from January 28, 1966, LBJ is in the process of expressing his concerns to Vice President Hubert Humphrey that Humphrey’s travel plans might tip people off to an important impending meeting on Vietnam at which key decisions would be made. “I don’t want to take a chance on telegraphing Ho Chi Minh before my boys get there,” he says. He then provides the following illustration from the Cuban missile crisis. From this clip alone, it’s not clear what LBJ is talking about. But in another conversation three weeks later with National Security Adviser McGeorge Bundy, he went into more detail on his source. LBJ And that's the only thing that worries me. Because to just be perfectly frank with you, I've been saying things the last three or four days in conferences in the hope that I would get a little feeler, and I think they've been getting back over there. I don't know whether you know it or not. You haven't been in on them. LBJ But you can't have a conference with two people here without it getting back. The Joint Chiefs of Staff wrote a letter to [President] Kennedy recommending that he bomb the missile bases in Cuba and that he let them have it. And the letter had been signed and went to [General Maxwell] Taylor's office. And before Taylor could get it over here to Kennedy, why [Soviet Premier Nikita] Khrushchev got his here. Humphrey Good Lord. [both laughing] God Almighty. Source Tape: Tape WH6601-11-9541, Lyndon B. Johnson Library.